I have an exciting post for you guys today. 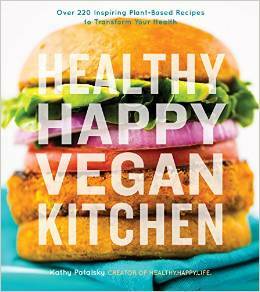 I am reviewing Kathy Patalsky’s new book, Healthy Happy Vegan Kitchen . You may already know Kathy from her awesome blog, The Lunch Box Bunch/Healthy Happy Life. She is also the founder of Finding Vegan, which is a pretty awesome place to check out lots of yummy vegan recipes! If you are new to veganism, Happy Healthy Vegan Kitchen is a great book to start with. This book is packed with 220 easy vegan recipes! Not only is it full of yummy recipes like, coconut oil blueberry muffins, sprout avocado sandwich, curried quinoa patties and the strawberry avocado mache salad, it also comes with wellness tips and tips on stocking your vegan kitchen. Not only am I reviewing this book, I am also sharing a recipe and offering a giveaway to you guys! Yay!! These cookies were seriously good. They didn’t even last a day in our house. I know you will love them too. If you want to pre-order the book, you can do so here . Good luck in the giveaway! In a bowl, combine all the ingredients, except the jam, until a dough forms. Roll the dough into balls and place onto a lined baking sheet. Use your thumb to make an indent into each cookie. Place the cookies in the freezer for 10 minutes to solidify the shape for baking. Bake for 8-10 minutes. You can tell they are done when the edges are slightly browned. Once the cookies are done, place a small amount of jam into each thumbprint. Place the cookies in the fridge to chill. Serve the cookies once they have firmed up a bit. These cookies are best served the same day they are baked. Thank you for introducing me to this author. The cookies sound delish and I look forward to seeing more from you both. Thanks Laura! Good luck in the giveaway! These cookies look so good! And I am sooooo desperate to get this book! The book is beautiful! Good luck! I am having trouble getting the dough to come together. I've added more coconut oil and peanut butter. Any other suggestions? Thanks. Really? :( I am sorry you are having issues. I had to use my hands to get the dough to come together. You're welcome!! I hope you enjoy the recipe! The book is beautiful! You will LOVE it! These cookies look amazing! So excited for Kathy's new book! Thanks!! The rest of the book looks awesome too. I too am having issues with the dough coming together. I added more coconut oil. Should I add more almond butter? I hate to waste all of the ingredients but right now it is flaky and not coming together as a dough. I have been using my hands to mix it as well. These looks fantastic! Thanks for sharing! 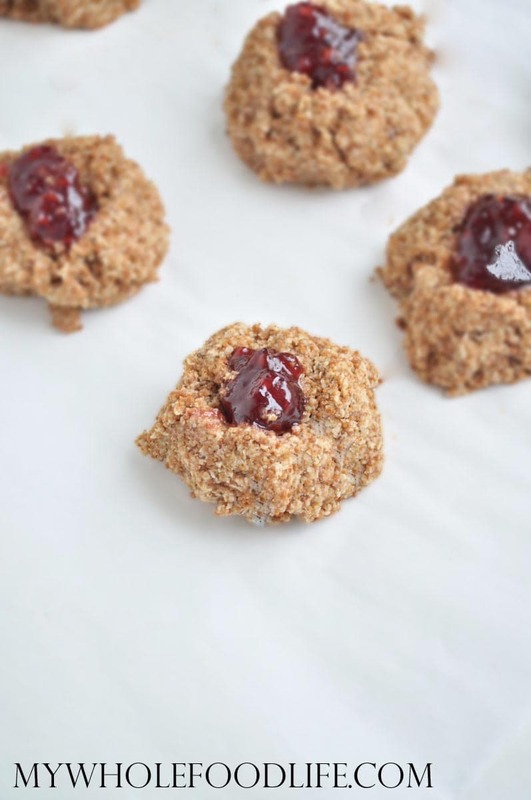 These almond jelly thumbprint cookies look so delicious, these would be awesome with a cup of tea. The ingredients did not want to come together like dough. After looking at the comments and seeing others had the same experience, I felt better knowing it wasn't just me. Tried mixing by hand, but no go. Added more almond butter (same amount called for again) and finally got something that would hold together in a ball, but not enough to make a thumbprint. Stuck them right in the oven for 8 mins. They do taste good, so yay.